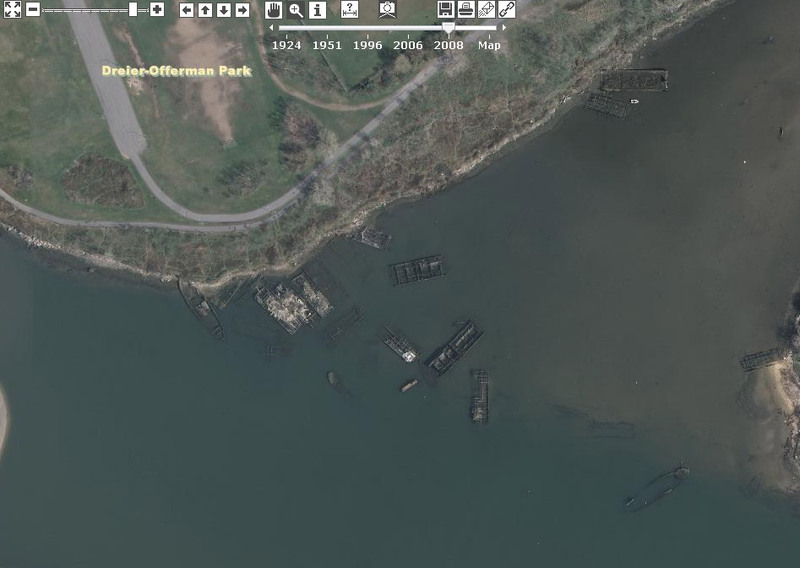 The recent shipwreck found at the World Trade Center site is not visible on NYCityMap but there are other interesting waterfront features that remain. Most hark back to the City’s waterfront heyday when shipyards, industry and terminals were preeminent and commerce was the focus. Presently the waterfront area is seen as vital for parks, recreation, public access and nature preservation. 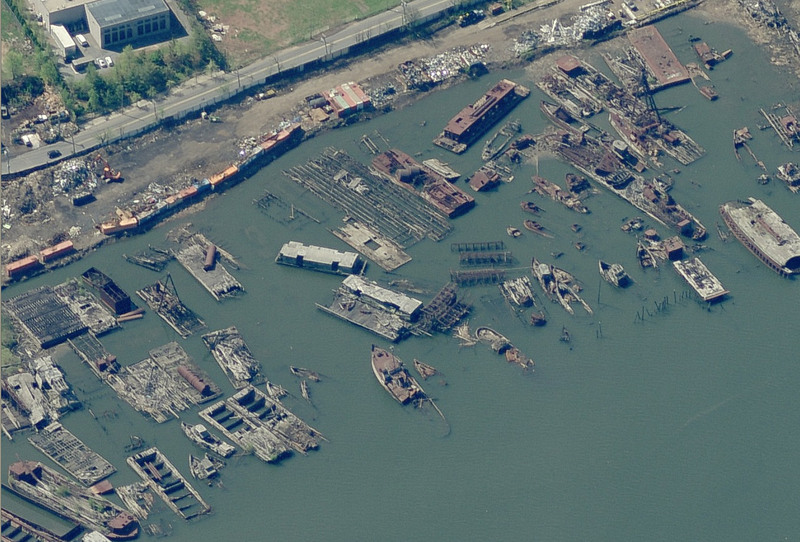 As eloquently described in a NY Times article, ‘If each shipwreck is a biography, then the half-mile-long marine scrap yard owned by the Witte family on the west side of Staten Island is a library.” The shipwrecks can still be seen in the current aerials. 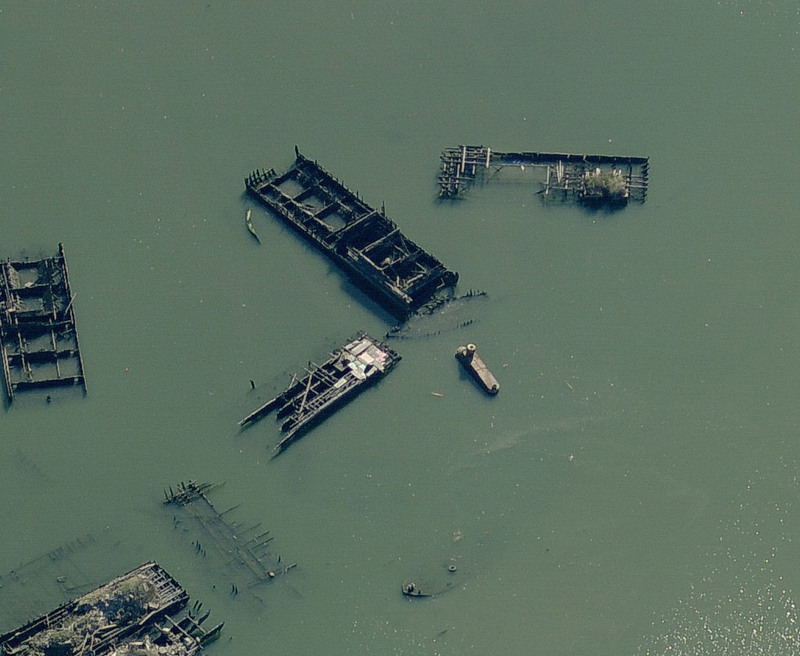 Another impromptu decaying maritime museum can be found within Coney Island Creek. The gem here is the ill fated ‘Yellow Submarine’ built by Jerry Bianco to raise the sunken Andria Dora. The sub sunk on its maiden voyage and nature has taken over. A new waterfront era is in the works. The City is actively engaged in planning for a revitalized waterfront. The NYC Comprehensive Waterfront Plan prepared by the Department of City Planning can be accessed here. Nonetheless, examples of a revitalized water front abound. In most places, if you ask someone to define or describe a square, they will say something like, “it is a geometric shape that has four equal sides, with four equal angles.” This seems pretty straightforward until you come to New York of course, where everything is unique, even the squares. The classic case in point, Times Square, which as you can see in the image below is more like a triangle! In the West Village in Manhattan, we find a tri-fecta of triangular squares… Jackson Square, McCarthy Square and Abingdon Square… all shaped like triangles. As if that wasn’t enough, take a look at Bartel-Pritchard Square adjacent to Prospect Park in Brooklyn. It is actually a circle! Circular squares… Only in New York. We recently updated the Federal Stimulus projects and added a new group of capital projects, NYC DOT 10 Year Capital Plan. Identifying a Federal Stimulus project now shows additional information about that project including the lead agency and a description. In a joint effort with the NYC Department of Transportation, we have made available the approximate location of street blocks and intersections that are part of the NYC DOT’s 10-year capital street reconstruction, bridge & other projects. Click here to read more about current projects at NYC DOT. Did you know that Governor’s Island (located in Upper New York Bay) was expanded in the early 1900s by approximately 82 acres from landfill that was excavated during the construction of the Lexington Avenue Subway? Since the 18th century, Governor’s Island served as a military installation for the US Army and the US Coast Guard. More recently, the City entered an agreement to take full control of the island’s development from the State, and unveiled a new master development plan. According to The Trust for Governors Island , “The Park and Public Space Master Plan is a comprehensive design for 87 acres of open space on Governors Island, rejuvenating existing landscapes in the National Historic District, transforming the southern half of the island, and creating a 2.2-mile Great Promenade along the waterfront.” To see the islands future visit here. And in late 2010, it will serve as the official site of the 2010 DoITT retreat!